If that is indeed what happened, it’s sickening in my opinion, but Wilson’s case will be settled by the courts. The point here instead is to address how we perceive ourselves in the Adirondack region. At the end of the article was this: “Sheriff Kevin M. Wells said the cross-burning was an isolated event. ‘It’s not something that occurs here.’ ” If only. The most attractive stance we can take is to agree that the sheriff speaks for us all, but sadly, we know that’s not true. We’ve certainly improved in some ways, but we were once much worse. This awful incident can be a teaching moment: don’t be smug about how good we think we are, and remain vigilant for any signs of evil and ugliness rising here again. Again? Here? Welcome to the 1920s, when the North Country became a hotbed of KKK activity. Yes, the Ku Klux Klan was here for several years on a high-profile recruiting effort. As you read this, you’re probably feeling confident that they failed miserably among the good people of the north. Actually, they did quite well, signing thousands of new members to their ranks. 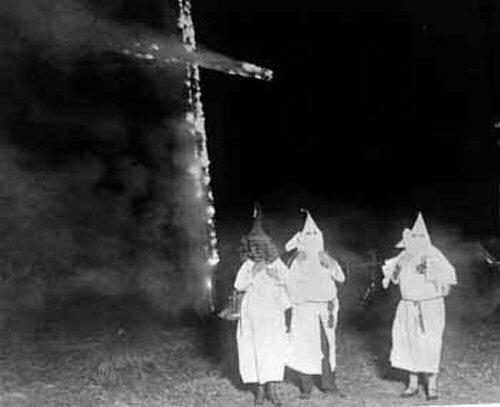 The original KKK died out in the 1870s after focusing on racial issues in the post-Civil War period, but the KKK of the 1900s was a different animal. 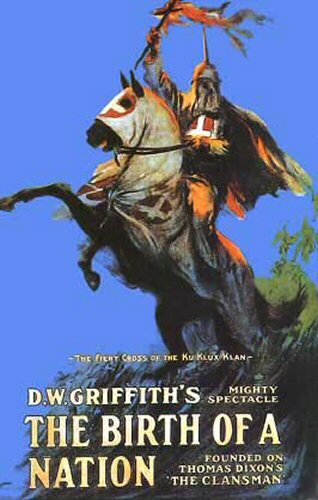 Its resurgence in 1915 was linked to a movie released that same year, Birth of a Nation, based on a book titled, The Clansman. While the movie was lauded for groundbreaking filming techniques, it was also highly offensive, featuring blatant racism and the rewriting of history. It was subsequently used as a Klan recruiting tool, leading to increased violence against blacks. Though the film received harsh critiques from religious and civil-rights groups, KKK organizers remained undaunted, gathering in Georgia for the beginning of a new era. The event was marked by the mountaintop burning of a cross. The fiery cross, of course, became their signature. The Klan entered politics by “shrinking the tent.” Instead of just attacking blacks, they added other targets: Jews, Catholics, and immigrants. With a mantra that sounds disturbingly familiar today, Klansmen offered themselves as the definition of “Americanism”―zealous patriots, religious fundamentalists, and Caucasians. And it wasn’t for men only. There were several female branches of the KKK. Some wielded power by voting as a bloc and organizing boycotts against businesses owned by those considered less than 100% Americans (in other words, non-WASPs). The Klan’s power in New York was evident in Madison Square Garden at the 1924 Democratic National Convention, sometimes referred to as “the Klanbake.” They despised candidate Al Smith, the first Catholic to seek the presidency. Smith was governor of New York, and in the 1920s, the Klan spared no effort in trying to destroy him on his home turf. From Albany to Plattsburgh to Watertown to Syracuse, they recruited like-minded souls. We should be embarrassed to say that they did quite well in most quarters. In the Albany area, there were more than 11,000 members. Meetings across the North Country attracted hundreds, and sometimes more than a thousand. Hooded robes were a routine component of the gatherings, along with pamphlet distribution. In most instances, the meetings were marked by cross-burnings. At other times, crosses were burned in the days preceding or following meetings. Sometimes it was spontaneously done by locals who felt compelled to display their feelings publicly. It may come as a surprise, but in the 1920s, it happened here with alarming frequency. There were deniers who attributed cross-burnings to local pranksters―young men with a skewed concept of what constituted humor. Others laid blame on radical followers of the KKK. But the fact is, in the three-year period of 1924–26, there was a cross-burning in the North Country at least once every two weeks on average. It wasn’t pranksters and it wasn’t radicals. It was citizens of the region, exclusionists who subscribed to the beliefs of the KKK. And it happened in more than 35 communities. In one particularly ironic instance, a cross was burned on the grounds of the Ogdensburg Free Academy. Blacks and Jews were targeted, but their numbers in the north were minimal at the time. Catholics and immigrants, however, were another story entirely. Irish Catholics were a large part of the region’s population, many having immigrated from southern Quebec or directly from Ireland. Likewise, great numbers of Italians, Poles, Welsh, Russians, Lithuanians, and Germans were manning our mines and railroads. This constituted a big problem for the KKK, whose early success in rural northern New York eventually faded. After all, how could it sustain? They were stepping heavily on just about everyone’s toes in the region. And that’s not all. Adding to the mix in a big way were bootleggers. The KKK targeted criminals as un-American, which didn’t sit well in the North Country at the height of Prohibition, when thousands were earning extra money by illegally running booze across the border for shipment to cities in New York and on the East Coast. By 1927, the KKK’s presence was drastically reduced in northern New York, and within a few years, their influence waned elsewhere. But be aware that the lunacy never ends. In every decade―yes, every decade―since that terrible time in the 1920s, some misguided, uncaring, or hateful troglodyte in the North Country decided that burning a cross was a good idea. A notable incident took place in 1960, when four Norwood-Norfolk Central School teachers burned a cross in Potsdam, after which they were fined in court and pressured into resigning. Irony plays a role in their story as well. Two of the four were Citizenship Education Teachers. Perhaps sentencing to a self-awareness course would have been appropriate. The phrase “ugly American,” referring to boorish travelers, joined the lexicon in the 1950s. It’s a mystery why the term wasn’t coined in the 1920s for an entirely different purpose. Bigotry exists to the extent fear exists. Bigotry is the mark of the coward. We all should know the history (anti-semetic & othwswise) of such stalwart Adirondack institutions as the Lk. Placid Club & the Ausable Club. I might add this to the teaching moment: be an example of the good we’d like to think we are… you never know who might learn from you. One thing that does surprise me is that this recent cross burning didn’t end up in video form on youtube with millions of views. It seems as though we, as a society, enjoy reveling in hateful behavior (makes no difference whether it’s ours or other’s).